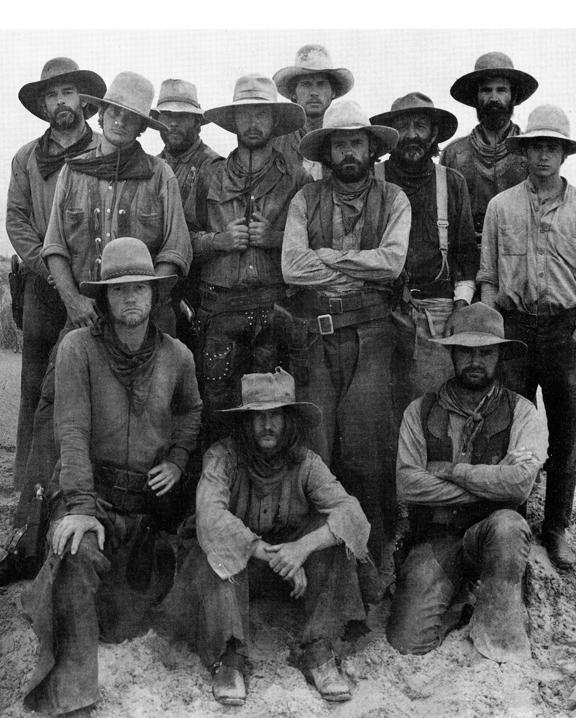 Contrary to popular belief, when it comes to authenticity in Westerns, Hollywood gets it right more often than they get credit for. That is the premise of a big feature we are preparing for an upcoming issue of True West magazine. 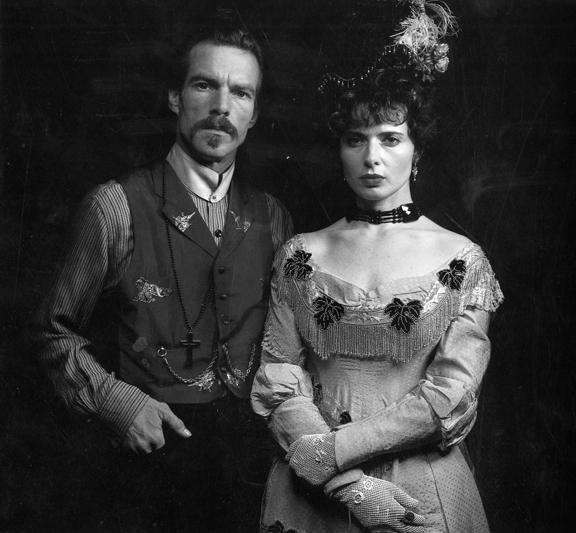 Quaid is fantastic as a lunger and although Val Kilmer gets all the raves for his work in "Tombstone," Quaid captured the look of the emaciated Doc perfectly. 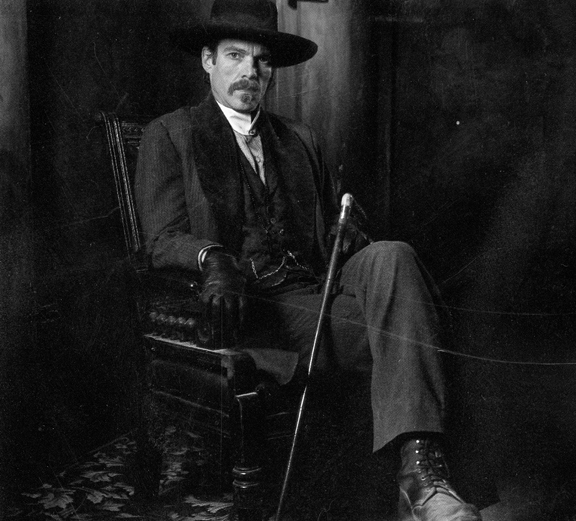 Here's another photo from the set of "Wyatt Earp." Dennis Quaid as "The Man In Gray"
There are sleepers in our coverage, films that were so authentic looking, stills from the movie often end up in history books. 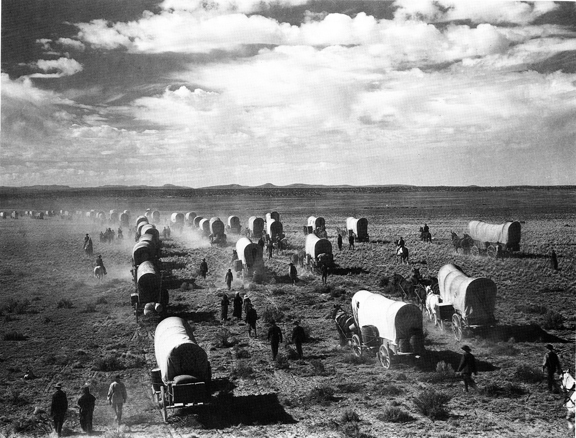 One of the advantages to the older films, like "The Covered Wagon," above, is that the clothing, props and wagons were still around mere decades after the passing of the Old West and in many cases, still being used! I have seen the above photo and this next one, below, being passed off as historic photos, that's how good the authenticity is in these scenes. "It doesn't matter how accurate a story is if you can't keep awake through it." 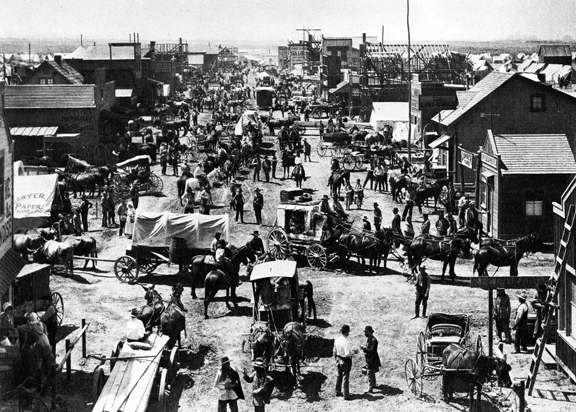 Another early film pulled out all the stops to create a sprawling Old West town in what turned out to be the largest Western town set in American film history. Of course, the Western that I absolutely love on many levels is, in many ways, considered to be an odd one. The authenticity of the town being built as the movie opens and progresses is quite authentic, with walls and roofs unfinished, and boards hanging out. I love it we see McCabe (Warren Beatty) sewing his shirt. Sewing! When is the last time you saw Gene, or Hoppy, or the Duke for that matter, sewing?! Then, in the main saloon people are talking over each other and you can see their breath! It's that cold. In fact, what I really love about "McCabe" is the weather, the snow, the freezing conditions and heavy overcoats. I think, for my money, it's the most authentic weather in a Western, ever! Some Westerns get dinged for having bad hats and incorrect weapons for the times they are portraying, but then the geography is dead on. "Heroes are not giant statues framed against a red sky. They are people who say 'This is my community, and it is my responsibility to make it better.'" I was thinking about "Bad Company" as I was reading the above article...absolutely "Bad Company"captured many authentic accuracy's of the times. Even the music was perfect. 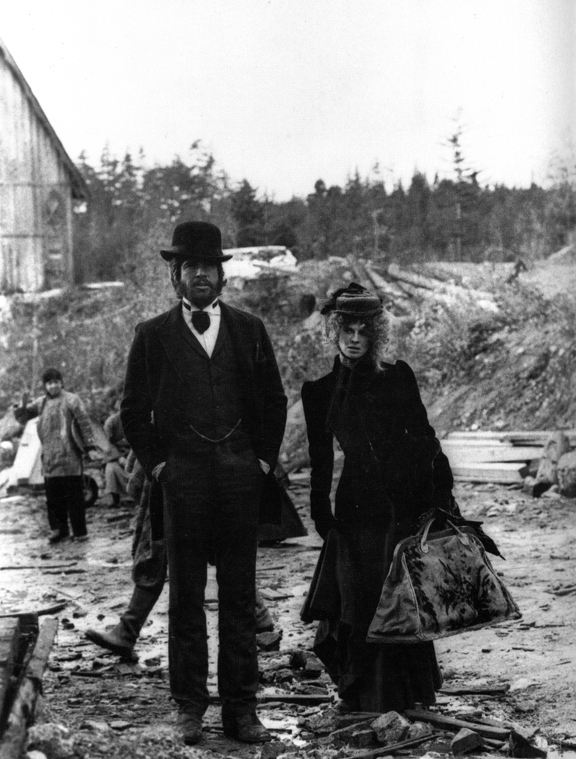 Bad Company would have been close to perfect if it took place in the 1880s or 90s. The cartridge revolvers, clothing and mention of Curly Bill Brocious were all anachronistic to the Civil War era but I imagine they wanted to set it then for political relevance (it's about draft dodgers made during the Vietnam War). I just found my new winter project. Here in Minnesota (presently at a balmy 27 degrees) we are always looking for ways to pass the time during these cold winter days. I'm going to try and watch all of the movies you mentioned in this post. "Alexa, find me Shane". Keep us posted and keep yer wood dry. I haven't seen most of these. Will have to make some time to do so! Thanks for the informative article. Thanx for including "McCabe" in there. Keith Carradine' death scene made the theater audiences go silent. Leonard Cohen's music. And YES, the weather...the dripping rain, the snow.......tremendous western. I remember that scene. Blew me away too. Great choices in particular The Covered Wagon (1923). TCW was the template for every Western ever filmed since it's release. I had the pleasure of seeing this film for the first time over ten years ago (I rented it from Eddie Brandt's Saturday Matinee in No. Hollywood) and was so enthralled I have been canvasing it's merits ever since. It has been on the top ten Westerns lists since then. Not only is every scene classic, it was the first time many of the historical events were ever put to film. And they were shot without gimmicks nor special effects, yet just like the original pioneers actually accomplished them. In addition, the acting is surreally "non-silent film style" in that the acting is natural and completely unlime the 'weird' machinations of grandeous face and body movements so typical of acting during the silent era. 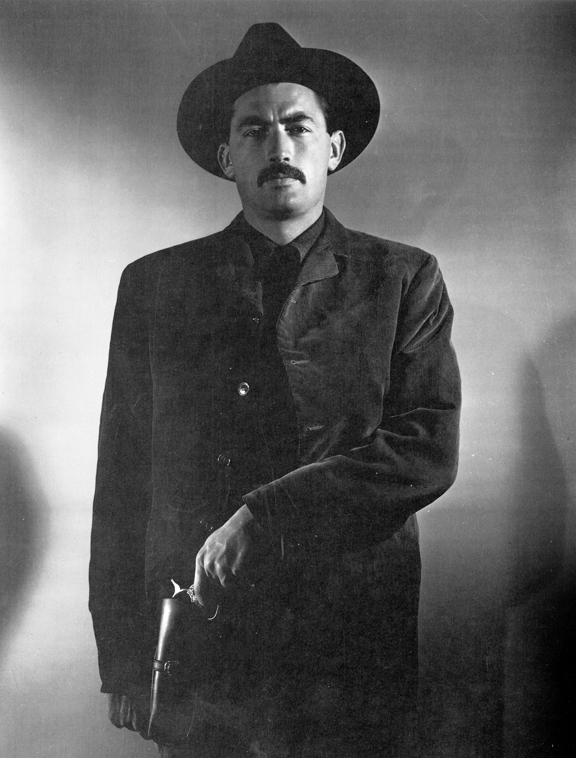 A lot of credit has been given to John Ford's silent Westerns especially The Iron Horse. But it doesn't hold a candle to TCW. 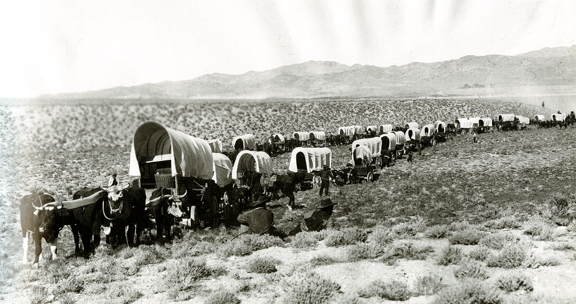 Don't even think to write your best of Westerns list without first seeing The Covered Wagon. Shane was my favorite until Culpepper Cattle Company came along. Most authentic western still. 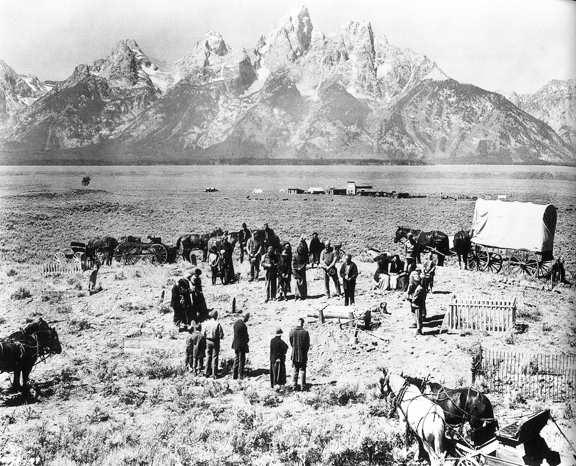 Even Shane had some set problems like the muddy town; as if it rained only over the few buildings but the rest of the prairie in the background was bone dry. One of Robert Duvall's recent westerns had the same issue but no one in the cutting room noticed it. I still love Shane because it was my first western in color that I watched as a kid. The look of Shane is far more accurate than Culpepper. According to the trailer Culpepper takes place in the 1860s, yet all of the costumes and weaponry are incorrect for that time. Still a good film until the tacked on Peckinpah-lite ending. What about'Dead Man' w/ Johnny Depp? Buffalo Girls... Larry McMurtry's sleeper that followed the life of Calamity Jane. Great movie! Culpepper Cattle Co. was a good western Billy "Bush Green was the head honcho. Well, IMHO, Lonesome Dove surely should have drawn a least, an honorable mention. And... where is Monte Walsh w/ Lee Marvin? Probably the best ever, movie on the short life of the American Cowboy & with the exception of Marvin's mustache that would appear & a little later, it did a disappearing act, it was masterful. Open Range was another good authentic western. To the purist, an authentic western shines like a new penney!! Sadly, not many are made any more as sci fi are the hot item now. Always thought Culpepper Cattle Company was underrated. Although it has something of a 60/70’s feel to it, I thought it was as realistic about Cattle & Cowboys as any I’ve seen. I might suggest Will Penny with Charlton Heston for consideration. It seemed authentic. I don't think Quaid did a "better" job than Kilmer, I think he probably looked more like what Doc really looked like...and probably acted. 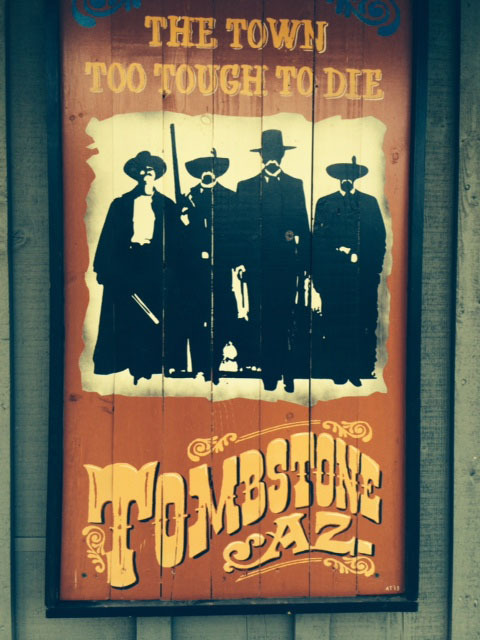 Conagher, Hondo, seemto fit our families true story in the Western Frontier. Conagher and Hondo seem to follow our families true story in the Western Frontier of Texas pretty close. Great article. Informative narrative. Wonderful photographs! I hope you'll talk with me about THE MISSING, and the two Apache elders I involved with the production. One of your reporters interviewed me with regard to Michael Blake, because I am working on the sequel to DANCES WITH WOLVES. Both great films!! Although Hondo was shot in 3D as you can tell by the Indian stabbing right into the camera while fighting Hondo! Thanks for the reminder of how great some films are. "Long Riders" is the best retelling of the James-Younger saga. Real-life brothers cast as the James, Younger, Miller and Ford Brothers. Outstanding and authentic music by Ry Cooder. What? Not one mention of True Grit 2010? 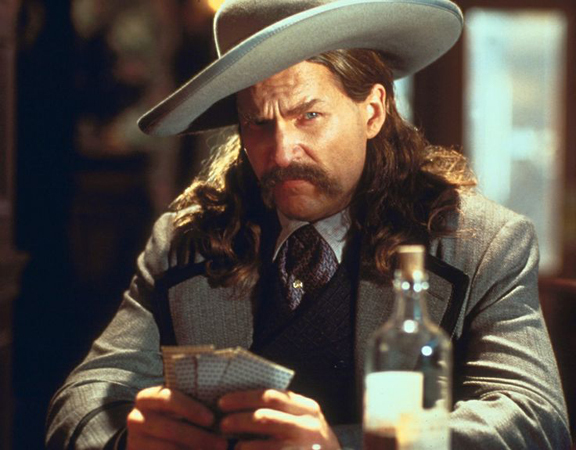 Jeff Bridges may have nailed the Wild Bill look, but he captured the Rooster Cogburn character.